Opal Koboi, power-crazed pixie is plotting to exterminate mankind and become fairy queen. If she succeeds, the spirits of long-dead fairy warriors will rise from the earth, inhabit the nearest available bodies and wreak mass destruction. But what happens if those nearest include crows, or deer, or badgers, – or two curious little boys by the names of Myles and Beckett Fowl? Yes, it’s true. Criminal mastermind Artemis Fowl’s four year old brothers could be involved in destroying the human race. Can Artemis and Captain Holly Short of the Lower Elements Police stop Opal and prevent the end of the world? Finishing The Last Guardian was like finishing Looking for Alaska and The Book of Lost Things. It is just so divinely written, perfectly executed in its story, storytelling and structure, and just leaves you so emotional and filled with joy and feelings of sadness and happiness and all those half-half emotions, that you just have to stop and sit and just recover for about half an hour to a fortnight. This final story in the Artemis series and one that exits with a lot of grace, a lot of action, a lot of laughter, as well as suspense and adventure, just like we have come to expect from Colfer and all his characters. As the blurb reveals, an old foe has returned to seek power and most likely world destruction, and once again it is Opal Koboi. There is a point where you do start to marvel at Opal, her plans are extremely clever and complicated, and they are not basic smash and grabs, there is an eerie patience in her that adds to her danger. She is willing to wait for what she wants and doesn’t really care who gets in her way. Her intent this time around is to bring ancient fairy warriors back from their long-dead state and wreak havoc on the land to bring about the end of humanity. So a little more smash and grab than before but with a great level of complexity attached. After seemingly escaping a paradox in the previous book, Opal creates a new one, this time one that impacts not only on the Underworld, but the human world as well. With the human world in total chaos, and the Underworld trying to stay standing, there is a lot of pressure for Artemis to fix things before they get any worse. I liked the idea behind Opals plan, it was a great, grand, last book plot, one that I think Opal was ideal at leading. There are so many small details and connections throughout that make it work. Being Opal’s plan there are many individual factors that must work, but there are limitations when stage one events do not always go to plan which creates the suspense and drama. Colfer leads us into the story and main events with an even pace where we see the resolution of the previous book, one I was very glad about, and then we’re lulled into a nice rhythm and safety before everything erupts. Then you relish as you try and keep track of the multiple storylines that are running simultaneously, all eventuating in the inevitable collision where your anxiety and suspense really develop the further you read. It is hard not to make this sound like a fast paced action book, and in a way it is, but it also isn’t. If you know the previous Fowl books you know the pace Colfer provides. It is one where there is a lot happening, a lot of drama and action, but while it seems you are racing through things you really aren’t. You get caught up in the emotion and the theories running through your mind about what is going to happen next and you get so involved that it doesn’t matter how Colfer paces it, it flows seamlessly and you just ride it along, opened eyed and mouth agape from what has happened and what on earth possible will next. We are shown a lot more of the twins Myles and Beckett this time around, as well as Juliet which is nice, though not always as we’d expect. As characters the twins really do grow on you, even in this book when they are not always themselves, there is a strange charm displayed by a four year old possessed by an ancient fairy spirit. When they are not possessed the true Fowl nature and Artemis influence emerges again which either delights you, or you could just think they are already that pretentious at four, where will they go from here? It could go either way. Though Colfer’s decision about the differences between Beckett and Myles is interesting, while it appears one is much further advanced, there are moments when they are both as formidable and intellectual as each other. What I also enjoyed what that even as the series comes to an end we are still learning about The People, their history and humanity’s role in their past, not to mention more secrets of the Fowls and their estate. It just goes to show that even in the final book there are still things to learn. There also seems to be a lot more humour and strange comments from characters this time around. With the stakes so high and with the excitement almost continual in some places, the comments made sound extremely confusing out of context and certainly are abnormal at the best of times. There is something about Artemis and the others that the more peril they are in and the worse things become, the more sarcasm that escapes their mouths. Always a bonus I must say, but even the less sarcastic simple statements of fact can be fairly humorous at times. Colfer writes in much the same way he always has, it is essentially just another Artemis Fowl book, but with everything that happens in this book that really isn’t true. It is the ultimate Artemis Fowl book. The outcome of seven previous books, watching that little twelve year old grow up through the pages and marvelling at all his antics, not to mention the world of The People, all comes together in 306 pages of bliss. Moving away from the general drama of Opal and her grand plan, there are some gorgeous moments about the characters. We really see just what the past eight books have done not only to themselves, but to their friendships and outlook on the world. Half the wonderfulness of this book is the characters and who they have become. As usual Colfer connects to his previous works, and the events in the previous book are not forgotten, not by a long shot. What is wonderful is that even all the emotion we had for Artemis in the previous book resurfaces and we see that even though he is cured, there remains a fear of the Complex returning. It is only happens occasionally but there is a certain moment I adored, it is almost a throw away sentence that you could miss, but in that simple sentence you know that under the chaos around him and the confidence he projects, you know the lingering fear remains that he will return to what he was. In the previous book we s how he saw himself, saw how he saw the world and the people around it, and it rightly terrified him. And in that simple moment where he has to double check he hasn’t reverted you see that he is truly petrified of it returning, and Butler sees it and it is just something that makes Artemis so much more beautiful as a person. The close friendship of all the characters really shines here, especially the relationship between Artemis and Butler, and Holly and Artemis. With both worlds on the verge of collapsing Colfer keeps the focus well on Opal and certain key characters, drifting only when necessary. You almost forget that humanity is falling apart in the distance, but the relationships really help drive this narrative as much as the events. As a final book the sense that things are being wrapped up is there, but you do not even notice at the time. Colfer weaves it in from the beginning so we gradually see how things have changed and where characters are in their lives. Familiar faces return, new faces are introduced and you’re almost lulled into thinking it is just another Fowl novel but there is too much emotion and joy and wonderment to ignore that this is Artemis’ finest hour and Colfer is going to make it tug at your emotions through the entire thing, laughing, crying or otherwise. I am giving nothing else away but emotion and vagueness as it is customary, because as another reviewer rightly put it, “to give anything away would be far more criminal than anything Artemis has got up to in the past”. It is a bit sad to have finished the series, but I couldn’t think of a better way to go out. This book, its beginning, the middle, the ending (oh god the ending! ), the detail, the conflicts, the development, the reflection, the references you only just remember in the nick of time, it is utter perfection and an excellent way to conclude a series. Criminal mastermind Artemis Fowl has summoned an elite group of high-tech fairies to Iceland. But when he presents his invention to save the world from global warming, he seems different. Something terrible has happened to him. The fairies diagnose Atlantis Complex (aka multiple personality disorder)—dabbling in magic has damaged his mind, with symptoms including obsessive-compulsive behaviour, paranoia, and multiple personality disorder. Unfortunately, Atlantis Complex has struck at the worst possible time. A deadly foe from Holly’s past is intent on destroying the actual city of Atlantis. Can Artemis escape the confines of his mind in time to save the underwater metropolis and its fairy inhabitants? 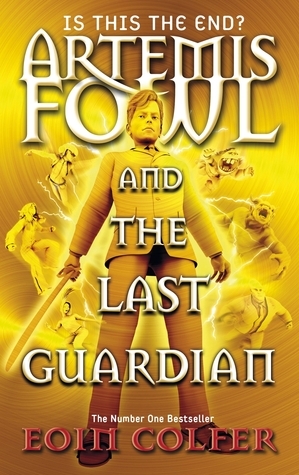 This is the seventh book in the Artemis Fowl series and it has not lost its momentum, its wonderful storytelling, nor has it forgotten where it has come from. The story continues from book six in the same way it doesn’t really. From book six we see the paradox created and Artemis and old foes facing off in a completely unpredicted twist of organised chaos, and now there is a whole other set of new things to deal with as a result. Due to his years of dealing with and lying about The People and his actions, Artemis has developed Atlantis Complex, something similar to OCD, delusional dementia, and multiple personality disorder. In something of a definite new direction Colfer makes Artemis the problem that requires solving, something inside his own mind that can’t be controlled. There is a wonderful line from Butler about how when Artemis is under threat he just needs to know who to shoot, but when the problem is Artemis’ own mind he is at a loss. I think that is beautiful, and it certain shines a light onto just how close and protective Butler is of Artemis. What was also wonderful was the pace we’re exposed to Artemis’ condition, nothing was rushed into and while we may not have seen the beginnings of the Complex, Butler describes its slow emergence and how he noticed small things at first until it developed into something that has taken over Artemis completely, something that becomes noticeable to Holly and Foaly. Artemis does well to cover it up, but little things like counting and his paranoia seep through the disguise, things he can’t control and it only gets worse as the story progresses and manifests in different ways. The Artemis way of trying to conceal it and use his own intellect to solve it become slowly overpowered as his reasoning and his behaviour cannot be helped, and he is fully aware of it happening which allow a great insight into Artemis’ mind and the affect the Complex is having on himself, even when he is not exactly sure what is happening. The blurb makes light of it and almost trivialises it, and I’m not saying having this Complex doesn’t produce some very funny moments, but the way we watch Artemis and those around him deal with this Complex is on occasion so moving and saddening and while the story tries to stay light, it only adds to the magic of the whole situation and Colfer’s unveiling. This is where Colfer’s writing works and we’ve seen it in other books, he offers a seemingly light story that is full of hidden darker meaning with a few obvious serious moments thrown in, mixed through with jokes and humour to fool you into thinking things aren’t as serious as they are. This approach isn’t relevant just to the Complex however; the other storyline is the threat to Atlantis and the scheme of Turnball Root, former commander Julius Root’s reprobate brother. This brings up its own deeper meaning and serious nature under a cloak of light heartedness. And with multiple events intertwined and connected with Artemis’ condition there are also many other aspects that come into play. As the blurb reveals, the enemy is an old foe of Holly’s, but the attention goes to more than just her, and interestingly, unlike past enemies there is a chance for a lot more sympathy to be given regarding the whole situation. While you disagree with Turball’s actions for a lot of the book, by the end it leaves you with this pathetic feeling (see original definition of ‘exciting pity or sympathetic sadness’) and you really don’t blame him for anything, which is truly terrible feeling because a lot of bad stuff happens in this book along with the good and you come out the end of it without seeing a real winner or victory. The whole ending is strange, and certainly a little bit darker if you look behind the light heartedness that tries to take the focus. It is like there is a solution but it does not feel like a regular conclusion, things are different than before. Though having said that, the entire book feels different, one enemy is from within the hero’s mind, while the other enemy makes you pity and admire him, it’s a complicated emotion and one Colfer causes and executes wonderfully. Restricted by avoiding spoilers here because everything is connected and everything is something, but there are a few fun things to talk about to entice and be vague about such as giant squids, interspecies love, Orion, zombies, wrestling, and giant blobs of doom, not to mention the wonderful and typical banter that goes on between all the characters. It really is a nice group effort this time around, characters from all books coming together, all having their part to play both individually and as a team. There are a lot of things happening, and as I say it all connects, but until it does there are some wonderful moments and scenes where a few characters have a seemingly dangerous but very fun time on their own, people pair up who you do not expect and smaller players get bigger roles this time around. Even away from the sympathy of his condition, Artemis has some wonderful and hilarious moments where the Complex impacts and influences certain situations so it isn’t all serious, and even then the serious moments are filled with humour. The fact Colfer makes you laugh through this entire book really brings the whole thing together. 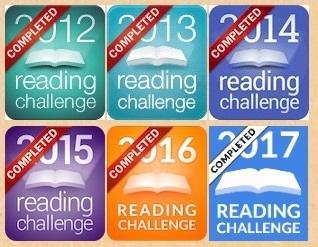 If not I think the risk of having it too serious and out of sync with the other books would be a failing. It could be seen a serious side step from the normal story trend but I think if you follow the series from the start you see how it is evolving and developing via the characters. Character development means new situations and focuses and really, the entire Complex focus is a key result of all past books coming to a head. Each book is connected and you really can’t have one without the other, like real life where past events influence new ones and Colfer never forgets where his characters have been and how this affects where they should go. And having past enemies returning is something that works much better I feel than a new enemy appearing each book, people and fairies alike hold grudges and when the moment comes, who wouldn’t take it. That is the angle Colfer is taking. For the reality of the world he’s created it isn’t prone to ongoing villainy and grand master plans all the time, it is the few conniving and manipulative people who keep trying to achieve what they want and then take revenge on those who stopped them before. I really loved Artemis in this though; I like how different he was. It is like in previous books where he reverts briefly back to the person he was in the beginning and you see this completely new side, but it’s nothing like it at the same time. I adored watching Artemis in his confused and altered state; it was something completely different and certainly unexpected. 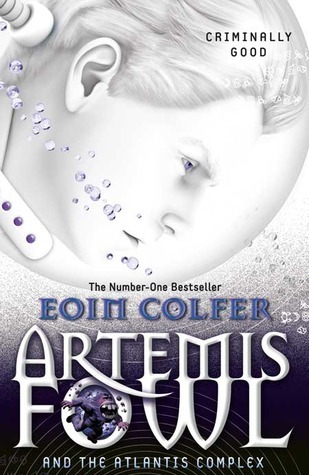 You knew from the blurb that he wasn’t going to be himself, but all you’re told is that Artemis Fowl has become nice, that does not prepare you whatsoever for what Colfer has in store, it so much more than that. It is so beautifully done, well planned out, well spaced out and so believable it is almost heartbreaking at times when you think too hard about it. What was fantastic about this book is that you can see the fear in Artemis, not the comic fear from past books where you see him out of his comfort zone, but proper fear from himself and what is happening to him. It is some of the greatest story telling and excellent execution I’ve seen. You get a sorrow for Artemis that you didn’t have before, you fear for him, you are scared for him and you worry about him in such a serious way you didn’t know you could worry for a character before. Colfer is magnificent with this book, Artemis is like we’ve never seen him before and it just works so wonderfully. There is a new side that clashes with the old side, and while we know Artemis is exceptional, he is only human, only a teenager, and after all that he has seen and been scared of, his mind terrifies him the most and you can see it and feel it in the way Colfer tells us his story. It’s simply magnificent and by far one of my favourite Artemis stories. But now his mother is gravely ill and the only hope of a cure lies in the brain fluid of the extinct silky sifaka lemur. 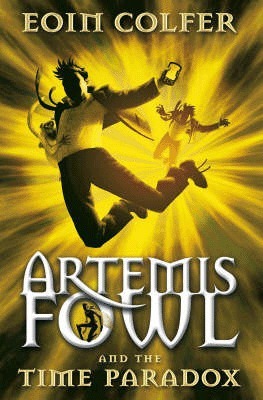 Artemis Fowl must travel back through time to steal the lemur. The rules of time travel are far from simple, but to save his mother, Artemis will have to break them all, and outsmart his most cunning adversary yet: Artemis Fowl, age ten. This was the book I was most eager to read I think to specifically see the story rather than just general excitement over the overall series. The ending of The Lost Colony opened up a range of questions and with an ending like the one Colfer gave us there was a need to see where the story was going to go or whether we’d be given a chance to see how it got there. So much had changed and Artemis’ world had changed so much that I was eager to see how Colfer handled it. Naturally, being Colfer, and with this entire thing planned to the letter, handled it brilliantly. The transition was seamless, there was no need to awkwardly explain anything, Colfer wove it through the narrative with a smooth fluidity that means as you read you just understood. It was all ok, and you found yourself being engaged and amazed in the new story before you could even think to question anything he had or hadn’t written. Hypnotic and distracting perfection, those are Colfer’s powers. Thinking about it, new characters have always been welcomed, they added to the expanding world. I think the only question I had, certainly before starting it and not once I had, was about the introduction of the twins and how they would impacted on the Fowl family directly, new Fowl members that made a huge difference compared to the introduction of a new aspect of the Fairy world. But truly, making Artemis a big brother could have failed but it didn’t. Artemis’ character and the fact that the twins have such unique and very Fowl characteristics and unique personalities makes them both a little bit wonderful. But despite this big change, it is not Artemis’ home life that is especially the focus, yes it is the base reason for the new adventure, but we do not spend the whole novel watching Artemis adjusting to being away for three years and having new siblings quite as directly. Colfer opens the novel in the middle of a situation where we instantly can gauge the relationship between the brothers and the Fowl Manor life. This simple action by Colfer shows us all we need to know, giving us comfortable acceptance over what is happening and what has happened with no need for us to see the missing scenes we know would have taken place. And once we have seen all is well, that is when he takes a sharp turn and sends us on our adventure, this time beginning with Artemis’ mother. When Artemis’ mother becomes deathly ill and all attempts at curing only make things worse, Artemis enlists the help of the People to try and save his mother. We haven’t seen a lot of Artemis’ parents through the series, sporadically and often with a purpose mainly, and this is similar here but it did not really matter. Angela Fowl is a great character to add to the mix. She gets a little bit more of a role while not really doing anything to begin with, much like Artemis’ father in The Arctic Incident, with the focus more around the intent of healing Artemis’ mother and all the surrounding events, consequences and causalities. Enlisting the help of Holly, No. 1, as well as Butler, and with no other option at his disposal, Artemis is determined to return to the past to procure the antidote for his mother. The trouble that is it to be retrieved not only in the past from a ruthless young Artemis, but from the Extinctionists he is planning on selling the lemur to. A group of people determined to capture and eat all the rare and endangered animals in the world certainly makes for a different kind of foe than in previous adventures, but naturally not all in as simple as it seems. Time travel soon becomes the least of their problems as new and old dangers appear around each corner. The Extinctionists are definitely a group that I wasn’t expecting. The idea seems jovial at first but the way their organisation has been developed really can unsettle you if you think too much about it. And reading about these Extinctionists kind of makes you think about where the real ones are in the world, sneaking around with these grossly abused and ill gotten wares, but Colfer manages to raise the issue and bring it to point without harping on about it which is nice. We see a small part of the old Artemis personality return when he tries to convince the others to travel back through time; this is before we actually see the actual old Artemis of course. With the events following the jump back we are shown a bit more of ten year old Artemis and his life before the events in Book One. I must say ten year old Artemis is almost worse than twelve year of Artemis but only by a little. His childlike compassion is understandable more so than as a twelve year old though. The contrast between young Artemis and his older counterpart is drastic, but having said that we have been gradually seeing an improving Artemis through the series, you do not realise how far he has come until we are forced to see the boy we began the story with side by side. And while we get to see little Artemis and Butler which is fantastic, we also see older Artemis reflect more on who he was and who he is becoming. I always liked tough and no nonsense Artemis but there is room I suppose for caring Artemis as well. 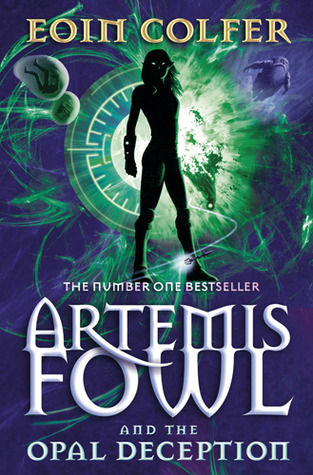 There is a jump between time as we see the present and the past action occur side by side throughout the book, but it is not confusing, at least no more than any other Artemis Fowl novel. The fact that Colfer is returning to the past is clever, and opens up for a lot of questions about what sparks an adventure, who influenced whom and as Artemis says, if it happened in the past then it has already affected the future. Paradoxes are hard to manage but Colfer manages this superbly. Going back to the past creates its own issues but the way it links together is fantastic. When authors go back after establishing a certain reality, similar to C. S. Lewis in the Narnia books, there is an advantage to create things and do things that bring about an event or occurrence that’s to come as it were. This is a terrific story that plays out and it makes you want to keep going if only to see how it could possibly be resolved. In addition there is a reappearance of old characters in large and small ways which is also excellently done. Colfer knows where to have people in a story and where not to. There are reasons people are included and whether they are excluded, no one is anywhere by mistake and nothing is mentioned by chance. There are Artemis’ schemes and sneakiness as per usual but we are also privy to more information, history, and detail about the Fowls than before which is an added bonus. There was even a truly wonderful heartfelt moment with Artemis towards the end which was moving and very brave I thought for him and for Colfer. But as I say, Colfer reveals everything to us marvellously and we are able to appreciate each moment no matter how action filled it is or the circumstance. I even detected an excellent Douglas Adams reference in there somewhere which I sincerely hope was intentional because it made me smile. You seem to go through multiple adventures at once with this book, just when you think one is over another rises up, and while it seems like a jumbled mess of chaos it works oh so brilliantly you can’t imagine. There certainly seems like a lot of planning involved and I would love to have been there when Colfer realised he could make the connections he does, or even whether it was his plan all along, either way I applaud him. As per usual there is just so much involved in an Artemis book that you cannot comment on it all, and even then you’d forget something or ruin a surprise so it is mainly emotion here because I am giving nothing else away. The joy is in the experience and unexpectedness as always, not to mention getting swept up in the characters, the chaos, and the pure admiration for the effort Colfer has put into not only each novel but the level of detail in the stories and the worlds in which they’re placed. Now the time spell is unraveling, and demons are beginning to materialise without warning on Earth. If humans were to find out about them, all faeries would be exposed. To protect themselves, the faeries must predict when the next demon will materialise. But in order to do so, they will have to decipher temporal equations so complicated even a great brain like Foaly can’t understand them. But he knows someone who can: Artemis Fowl. I adore this man, how can you not adore this man!? Why is it that he has the ability with a handful of words to change everything and make everything wonderful and beautiful and spectacular and astonishing and imaginative and poetic all at the same time! No matter what the situation there is time for quick witted jokes which makes it even better, and just when you think you finally have it sorted it out, the narrative is in place, and the ending is near, Colfer, in the space of a few words, changes everything! And I love him for it. Artemis Fowl and the Lost Colony begins with one thing, moulded into another and then changes completely. You do not even realise this until you finish the book and you think about the incredible journey you have just been on. Every time I picked up this book it was by force I put it down again, especially in the final chapters. It begins as all Artemis adventures do with the smooth charm that keeps you going, and then we merge into strange fascination, and then you are thrown into this experience where you just keep your eyes on the page, pay attention and use all your willpower not to skip ahead a few lines because as beautiful as Colfer’s sentences are, and how great his story can be, you just want to know what happens. You know you may have read a few Artemis Fowl books when you start to know what will happen before it is revealed. Not a lot before I assure you, only by a line or so, Colfer isn’t that willing to give up his secrets and twists. In a way I’m proud because I can still enjoy Artemis’ genius in what he has in store and what decisions and risks he takes; it has in no way become predictable. We are introduced in this book to a possible new foe and competition for Artemis, a younger, equally smart competition called Minerva. Colfer writes on the blurb that he is glad Artemis finally has some competition, I myself was wary, but Colfer handles it well, as does Artemis. Surprisingly, while you think Minerva is going to be the main point through the book, she isn’t. This introduction and seemingly proposed issue of a new intellectual conflict does not last long and the magical world takes priority once more. I enjoyed how Colfer gave us a new perspective with a new world and characters, as good as it was that he had been changing up the existing world, it was nice to see that there are other worlds out there. Similarly as he had done when we first learned of the LEP and the People, we are given a decent introduction of the world rather than a hurried and fractured welcoming through Artemis’ interaction or some other form. This new world is known as Hybras where a colony of demons and imps reside, living in isolation, awaiting the day they can take revenge on the humans who it seems are responsible for their exile. Despite all being equal to a degree, Hybras is ruled by Abbot, the wisest and most legendary figure in the land. All adore him and his warrior stories, all except one: No.1. No.1’s story is one we follow and discover that he is different from the others, and he doesn’t know why; that is until Artemis Fowl comes into the picture and changes everything. I liked No1, his innocence and naivety is balanced by enthusiasm and curiosity, and there is a lot plot wise that helps bring out the best in him, which makes him a great character. Along with the new, the same faces return, though not as frequently. I was rather surprised and excited with Colfer’s approach on this one, phrases and snippets referenced beforehand suddenly make a lot more sense at the end, and it reveals a lot about how important people can be in others’ lives. We had seen this in previous books around other characters but this I was not expecting; it was intricately clever and well done. The setting of this novel is mainly set in Hybras adding another nice change. With the initial introduction we are given further exposure through the actions of Artemis and friends. The events and risks taken in this novel bring great excitement to the story, as does the continual cryptic puzzles and problems that arise. Magic plays its hand once more in influencing and impacting on Artemis and in a few ways slightly more permanently. I know I am being deliberately vague about this entire thing because first of all, where do you even begin to talk about what happens in this book, and secondly, some of the surprises and twists are too great not to enjoy first hand. There isn’t a lot to talk about without revealing something wonderful so all you’re getting is vagueness and emotion. That hopefully is enticing enough. You can love these books for Artemis’ wit and charm and everything else but the end of this book I think was so unexpected I think it almost outweighed the delight about everything else. I simply adored the ending! I adored it! It freaked me out, it worried me, it confused me, and I am so eager and anxious to leap into book six I just don’t know whether to wait and calm down or power on through before the curiosity is the end of me. It opens the way well for the following book and the cliff hanger he provides is definitely going to be a game changer I feel. There is something about sudden and dramatic changes that can either change things for the better or worse, but knowing Colfer he has a plan up his sleeve and whatever happens is not going to be ruined or rushed, and handled with excellent care that we have seen before. As a character I am trying to decide which Artemis I prefer. I can’t say I prefer this Artemis over the ones we see in the earlier books, all are charming (he is always charming! ), and as he nears my own age it becomes less weird that I have such an affection for him. Right? Though I do love all the sides of Artemis, especially when he tries to fight the things he can’t change, and how no matter what he is doing he still manages to think systematically and plan ahead. The fact we see Artemis grow and develop through the books is wonderful, you see the child grow emotionally while still keeping the same sharp wit and intellect of the twelve year old. Seeing his character in the next book will be a treat I feel, especially as a result of the events in this book. A fun thing though I did notice while reading was that on the back of my cover (and now I must check all other covers) is a small disclaimer by Artemis himself. It reads: This man is NOT my biographer. He is a fantasist, writing sensationalist stories about me. I will neither confirm nor deny anything that appears between these covers. However, my lawyers – and my bodyguard – are watching. Signed Artemis Fowl ll. I love this as well, reminds me of the bits in Unfortunate Events where Snickett includes himself in the story. 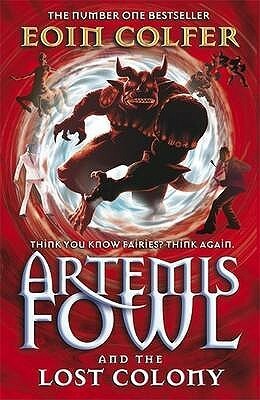 There is no real, logical reason to stop following Artemis Fowl, you can never tire of him, and Colfer has yet to lose appeal if this book is anything to go by. As long as his imagination, creativity, uniqueness and genius are all in working we have nothing to worry about. Artemis Fowl’s adventures will always be there to document, no matter how unofficial they may be. I would like to take this moment to quote myself if I may. Ahem, “What’s great is that there are no grand corporate plots, evil nemesis’ and no fairy political struggle infringing on the human world.” I wrote this about book one and I am actually rather pleased it has taken until Book Four to prove me wrong. Book four was always going to be interesting based on the end of book three, but this took it to another level. Artemis is always a fantastic character, but having to deal with the outcome of the last book, it only added to his charm. Book four sees the return of dear Opal. Poor Opal has not come out of the last LEP encounter all that well but that is not going to stop her. Revenge is the key theme through this book, always a thrilling subject. As I say, I like how we had to wait to see this grand scheme. We were not thrust into it unexpectedly, and we actually got to see the cause before the retaliation which was brilliant. It was not a knee jerk reaction, nor was it rushed and passed over. Colfer thought this out and it paid off. By waiting as he did, really for the opportune moment, it had the impact and the consequences it needed to suit the world and characters it affected. By now we have history and cause, we know all the characters involved rather well, and it gels together so much better once we have become invested in these characters and their lives. Like all Fowl books The Opal Deception is very intriguing and you only realise, well, I only realised how clever it was once I had finished. You knew it was clever and amazing and sneaky while it was going on, but then you think about it, and the title and the characters and you go, ‘ohhh, that’s quite clever actually’. We’re given the same great characters as usual, plus some new ones, each with a witty and unique personality that is executed well. Despite visiting the same people each time, it actually doesn’t get old, even if it does sound like that in reviews. Colfer has created these characters that each time is a joy to see them do what they do. And through the narrative and the events that take place, new sides of everybody are revealed and offers that little something different about them. The story offers twists very early on and doesn’t shy away from anything. This is a little bit of a shock but it is also brave and probably necessary. Though I say this seeing how it ended and guessing where it might go next. The internal struggles described and played out in this book were also very well done, and believable, especially for Butler and Artemis I felt. I approve very much of how Colfer keeps things in real time as it were. Artemis gets older, life goes on and real life happens amidst all this magical and exciting action and espionage. Can we call it that? I don’t see why not. I recall commenting on how enjoyable it was catching glimpses of a new side of Artemis when he is thrown into new situations, and this continues here. Whether it is his age or his experiences there is a new side of dear Arty seeping through and it is a joy watching him analyse and struggle with himself in his typical manner. But what I found great was how Artemis’ past actions had shaped him, and how without them how different he could have been. It makes you realise where he was in book one and how without realising it he has changed. There is the usual suspense Colfer offers, but in a different form this time I felt, just as intense mind you, but focused on different expectations. I loved it, it was making me anxious trying to cope with the mystery and suspense of where this story was going. Before it was a lot about the mission or the situation they were in, and the same was true here, but there is also an additional personal suspense I guess you could call it. Less about the adventure and more suspense and guessing about characters and the direction they were headed instead; very unexpected but welcomed. Though really, trying to guess where the story is headed and trying to think a step ahead of Artemis is always a challenge and a pleasure when it comes to these books. I think book four is a very good turning point in the Artemis saga. So much has changed by the time you are finished this book you really have no idea where it will go, again a little like the previous book, but Colfer knows what he is doing, and he directs us and leads us on the new path. I think these changes make book five more inviting because you essentially start a new saga of sorts, but with the same people you have known for what seems like forever. Definitely one of my favourites so far and one I would really like to read again quite soon.